A protester chants slogans during a demonstration against Algeria's leadership, in Algiers, April 12, 2019. The tens of thousands of protesters who have taken to the streets for an eighth straight week aren't the only crisis roiling Algeria. Helping to drive the unrest in Africa’s largest nation—and posing a serious challenge to any future government— is the economy. 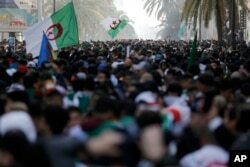 Tens of thousands of Algerians are seen gathered for a demonstration against the country's leadership, in Algiers, April 12, 2019. Young people chant slogans during an anti-government demonstration in Algiers, Algeria, April 10, 2019. 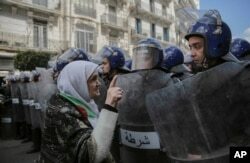 An elderly woman confronts security forces during an anti-government demonstration in Algiers, Algeria, April 10, 2019. “I'm sure the many of the slogans are going to be centered around anti-corruption, inclusive growth, economic justice, diversification, and job creation,” said Hamaizia of Chatham House.